Figure 7.6: Photosynthesis changes the energy from the sun into chemical energy and splits water to liberate O2 and fixes CO2 into sugar. Simply put, photosynthesis is the chemical combination of water and carbon dioxide in the presence of light to make sugar compounds. In reality, it is an incredibly complex process involving physical and chemical reactions through many steps. It is the process a plant uses to make the compounds that give it the energy to grow and maintain itself, or its food. 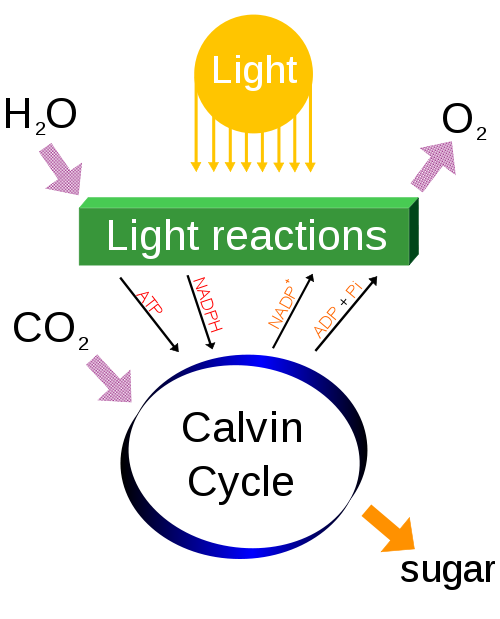 Photosynthesis requires light to excite the electrons in plant pigments, mainly chlorophyll, so it has to occur during the day and in the above-ground portion of the plant.